Some would say I'm a slovenly gardener. I like to think of it as practicing a little nonviolence in the yard. Instead of harassing leaves with a blower or rake, I leave them in peace. (Go ahead, groan.) Why buy mulch when it is at hand? And mulch you should. When I added fruit trees to my yard this year, I was concerned the soil wouldn't be fertile enough. My garden is largely native plants, so I'd never tinkered with the earth. But Lora Hall of Full Circle Gardening reassured me my soil looked great. "All that mulch is the best thing for it," she said. And you can breathe easier, knowing that your green "waste" isn't chugging along the freeways, creating diesel pollution. 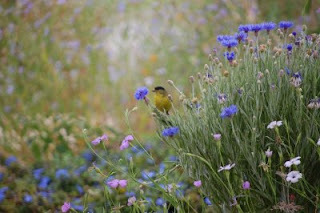 For more on conserving water and gardening with native plants, check out Emily Green's Chance of Rain blog. We've been sampling nature classes at various institutions. 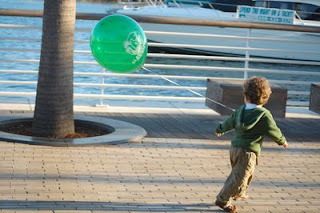 Our new favorite: Aqua Tots at the Aquarium of the Pacific. These themed classes are for toddlers (and parents), but the Aquarium also offers classes for all ages (including summer camp)--and the entire family. Upcoming Saturday Family Fun programs include "Totally Turtles," "Shark Sleuths," and "Magnificent Marine Mammals." 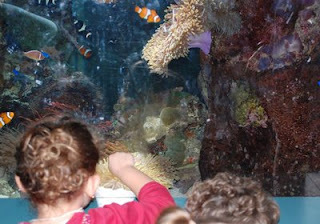 On our recent visit, we learned about the brilliant colors in the ocean. The kids helped our teacher--an engaging young woman named Staci--identify the colors and names of various plush-toy sea animals. 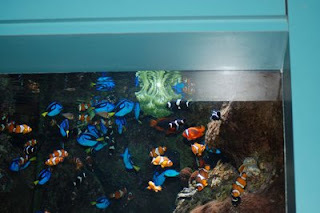 Then we fluttered around the Aquarium in search of brightly colored animals. Yes, fish at the Aquarium eat broccoli! (The green stuff at the top right of the photo.) I made sure to point that out to my son. In fact, I may print this photo for him; perhaps glue it to his highchair. Kids and parents oohed and aahed over this olive ridley sea turtle. 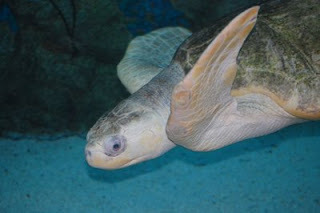 All species of sea turtles that swim in U.S. waters are endangered. In the eastern Pacific, olive ridleys have declined because of commercial harvesting by Mexican fishermen, loss of nesting habitat to coastal development, and accidental entrapment in fishing gear. When we returned to our classroom, we read a book about how some marine animals use camouflage. Then we dipped our fingers into a touch pool of local species. My son fingered sea stars, purple urchins, anemones, a limpet, and a swell shark. The swell shark takes its name from its talent for gulping air or water when threatened. This not only increases its size, but helps it wedge into cracks in rocky reefs. Finally, we make glued colored animal shapes into a book to take home. Kudos to the Aquarium of the Pacific for offering conservation-oriented educational exhibits. Take a moment to learn from some of the videos and exhibits that tell how you can help protect marine life. In coastal Southern California, our behavior affects the ocean--even if we live 30 miles inland. After leaving the Aquarium, we enjoyed cruising along Rainbow Harbor, peeking at the boats. We drove home after dinner; no traffic at 7 p.m. Next time, we hope to hop on a harbor cruise. More from me on the Aquarium of the Pacific. Explore the Aquarium's Online Learning Center. This probe also tests soil pH and light, but I don't think I'd count on if if I really needed an accurate pH. 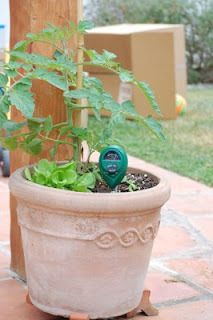 It has an easy-to-read meter, so I think it would be a fun project for a 4 or 5-year-old to tell dad or mom when it's time to water. Got a favorite garden tool? Do tell. Here's a fun activity for the whole family--okay, maybe not teenaged girls with a mortal fear of mud. 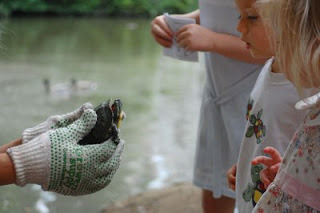 We recently tromped around the LA County Arboretum, with guide Colleen Biles, in search of turtles. The adventure was one of the Arboretum's monthly Family Nature Walks. Our group included 10-year-old girl scouts, a few infants in strollers, grandparents, toddlers and preschoolers. 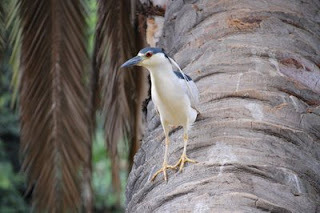 I was thrilled to get a close-up look at this Black-Crowned Night-Heron. They're beautiful birds, and usually more shy. But Biles says they've figured out that people here throw food that bring fish to the water's surface. Biles says the Arboretum usually discourages people from feeding wildlife, but if you're going to do it, please skip the junk food and crackers, and toss some vegetable scraps. This squirrel also seemed aware that people=food. He was unfazed by toddlers zooming past him. 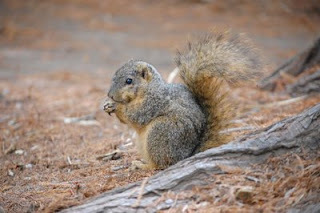 Eastern Fox Squirrels were also introduced to the Los Angeles area. (Our native tree squirrel is grayer and less common in urban areas.) Story is some civil war vets brought them West and kept them in cages at the Sawtelle Veterans home--until some administrator thought it improper to feed the critters on the government dime. So they were released. Sounds like folklore. But unlike the parrot stories, academics say there's good evidence for this one. My son also enjoyed inspecting goose feathers and climbing a tortoise-shaped rock pile. He was having so much fun, I had to lure him back to the car with the promise of seeing more peacocks. The Family Nature Walks are free with admission to the Arboretum. They're usually held the first Saturday of the month at 10:00 a.m. (No outing on July 4.) Space is limited to the first 25 people, but no one was turned away on our visit. This summer the Arboretum is offering quite a few family programs, including a storytelling series called Bookworms, KidsArt, and a Gettin' Buggy class on beneficial inspects in the garden (July 25). 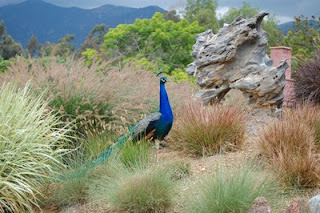 More on The Arboretum and Botanical Gardens of Los Angeles County. Curious about the flowers you saw on your last local hike? For starters, pick up a copy of Wildflowers of the San Gabriel Mountains by Ann and Gerald Croissant and, next time you hike in the Angeles National Forest, toss it in your backpack. It's a nice introduction to some of the most common flora. The book is light, small and arranged by blossom color, which is helpful for beginners. 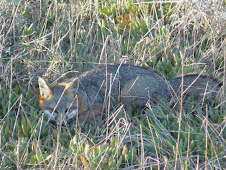 However, be prepared for some frustration: On any single hike you'll only spot a few of these. Still, once you figure out what lupines, salvias, penstemon, etc, look like in general, it will be easier for you to use more detailed field guides. (Here's my list of my faves.) This book also identifies nonnative (invasive) plants that have taken root in the forest, so take note before you tout all the amazing wild mustard plants you've seen. Oh, the eatin's gettin good around here! 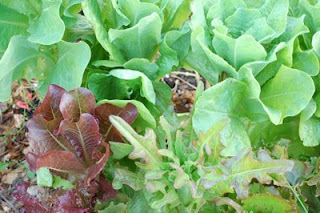 Sorrel: An easy to grow perennial; try it in chinese chicken salad. Beets and beet greens: Try shredding the young greens and adding them to salads. Not wanting to run my oven for an hour, I cut and sauted the roots (with carrots) as Ed Smith recommends in The Vegetable Gardener's Bible. I really like this book for general (organic) gardening advice, although it's not specific to our region. Carrots: My 7-toothed-toddler enjoyed thinning (pulling and eating) the tiny starts. He helped me plant them. 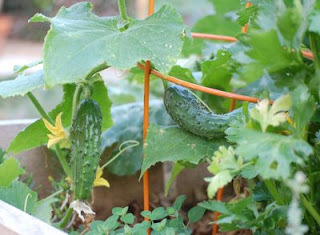 Mexican zucchini: Parents can grate it and sneak it into many kid foods, including "green eggs and ham." (A few) beans: I didn't plant enough (again). Basil: Can never have too much. Made our first pesto last week. Try it with pecorino/romano instead of parmesan. Corn: Our three plants already have eight ears. I mulched around them with the sweet peas I'd pulled from the spot. Some resprouted and may be providing (fixing) nitrogen on the spot. Celery: Okay, we're not enjoying it. It turned out incredibly bitter. Strawberries: Not many of ours got truly tasty and we were always battling slugs and pillbugs, despite using Sluggo Plus. Anyone know if strawberry pots help keep slugs at bay? Yes, I will also try beer spas. Sweet or not, my son never tires of picking them. We are about to hit the tomato jackpot. 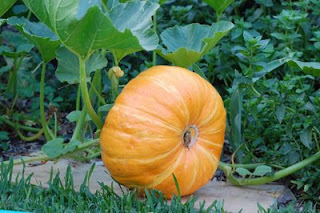 We started several San Marzanos from seed and the green fruit is huge, just about to blush. 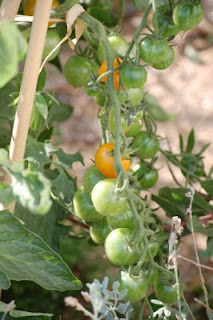 The sun golds are ripe, and we're gobbling them up right off the vine. Finally, we'll be eating pumpkin pie on Independence Day! We started ours indoors in early March, so they're giant already. Here's how we did it. The yuccas (Yucca whipplei) were in bloom. This plant is also known as "Our Lord's Candle" because when it flowers, its tall stock is topped with a large, flame-shaped cluster of creamy blossoms. In late day light, they seem to glow. Inside the nature center, our son was fascinated by the snakes. Mom got giddy over the darling California and Pacific Tree Frogs. We both liked the tadpoles and Western Toad. When our friends from Ramshackle Solid arrived, we hit the trail. We didn't get far, but it didn't matter. The boys had loads of fun climbing tree stumps, perching in the crotch of an old oak, balancing on rocks, digging in the dirt, and running wildly down the trail. We plan to return to sample one of Family Nature Walks. They're free and happen every Saturday at 9:00 a.m. Eventually, I want to join one of the California Native Plant Society Walks that occur monthly, September through May. More on hiking Eaton Canyon. Don't Be A Deadheader Some of my wildflowers (annuals) are blooming out. But I wouldn't dream of yanking or deadheading them. I love the birds that swoop in and gobble up the seed. My front yard is mostly packed with California native plants. But I've also planted others that can adapt to a low-water regime. That includes the humble cornflower (or bachelor's button, as some call it). Goldfinches go gah-gah over them. Which brings the birds to a nice height for my toddler to see them. If I leave the plants alone, they'll reseed themselves (no effort on my part). Other birds appreciate my deliberately sloppy gardening, too: mourning doves gobble up seed that falls on the ground. My son tries to coax them closer. "Come and play with me," he says. Sages are one of the best plants for attracting wildlife to your garden, according to Louise Gonzales, nursery manager of the Theodore Payne Foundation. "The humming birds adore the flowers," she says, "and then the seeds are high in protein so there’s a lot of different bird species that eat the seeds. So if you don’t deadhead them, you’re feeding alot of birds." 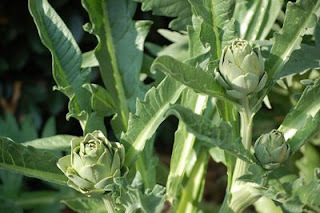 One of my favorites sages is a cultivar called 'Winifred Gilman.' It has deep blue flowers and a maroon tint to its stems. Bushtits (pictured above on 'Winifred') love to perch on them, gobbling up insects they find. This next photo is of a bushtit perched on my Englemann Oak. Bushtits are fairly easy to identify. They're tiny and move through your yard in small flocks. Interested in native plants? Check out these stories on local chaparral and coastal sage scrub habitat. To quote our two-year-old: "Yeah! I did it!" 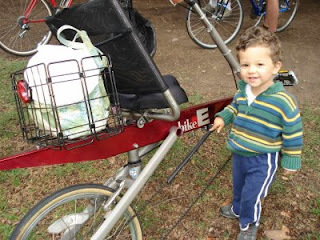 Our family rode in the First Tour de Arroyo cycling fest last weekend. Later in this post, I'll tell you about an easy, off-road, mini version of this trip. 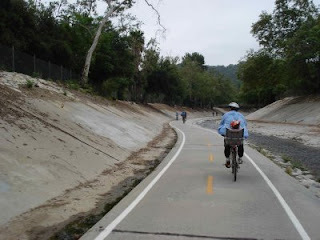 The Tour de Arroyo was organized by the Arroyo Seco Foundation to celebrate the late bicycling advocate Dennis Crowley and promote a green belt of open space along the Arroyo Seco. The Arroyo is a major tributary of the Los Angeles River; it's headwaters are the San Gabriel Mountains above Pasadena. For the Tour, cyclists gathered at Memorial Park in Pasadena. It was fun to check out the variety of bicycles. 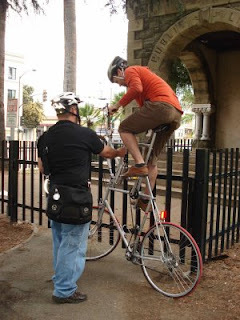 We rode city streets until we arrived at Arroyo Seco Park, bordering South Pasadena and the LA enclave of Hermon. 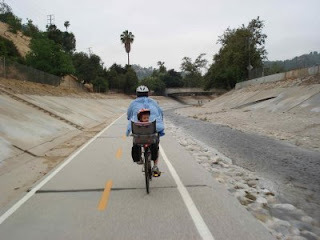 We road downhill, along the Arroyo--paralleling the 110 Freeway--for a couple miles. and pedaled, victorious, into Los Angeles State Historic Park (Cornfields). From there, our son was thrilled to be able to take the Goldline back to Memorial Park. It was an exciting day for all of us. We don't normally ride on such busy city streets, but biking with a group allowed our son to get a new view. Here's how you can bike a portion of this ride, without worrying about street traffic. You can reverse these directions if you live in the Pasadena area. You can also walk the trail, playing or picnicking at Arroyo Seco Park. It's a good choice for older kids, or little ones riding in strollers. (Not so great for toddler who'll want to get in the water or climb the concrete channel.) Look for red tailed hawks perched atop the sycamore trees, or circling overhead. Drive to the Montecito Heights Recreation Center. Heading east on the 110 Freeway, exit at Avenue 43. Travel two blocks to Homer Street, turn left on Homer. Park in lot. Cross park and head toward the Arroyo (alongside the freeway). You'll see the bike path running next to the channelized streambed. This path runs two miles north up to Arroyo Seco Park in Hermon/South Pasadena. The path soon ducks into the Arroyo, so be aware of the weather. 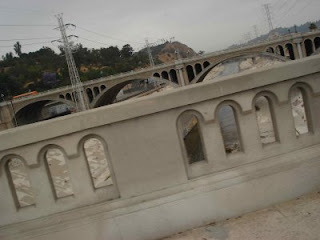 During and after rain, large amounts of water race down LA's channelized waterways and make them dangerous. Even on dry days, water flow here can be quick, so keep small children away from it. When you arrive at Arroyo Seco Park, look for the horse stables. Got more time? Combine this with a trip to nearby Debs Park. Got a favorite (family friendly) bike ride? Please let us know.